The National Athletic Trainers Association (NATA) held its 67th Clinical Symposia and AT Expo in Baltimore, MD June 22-25. 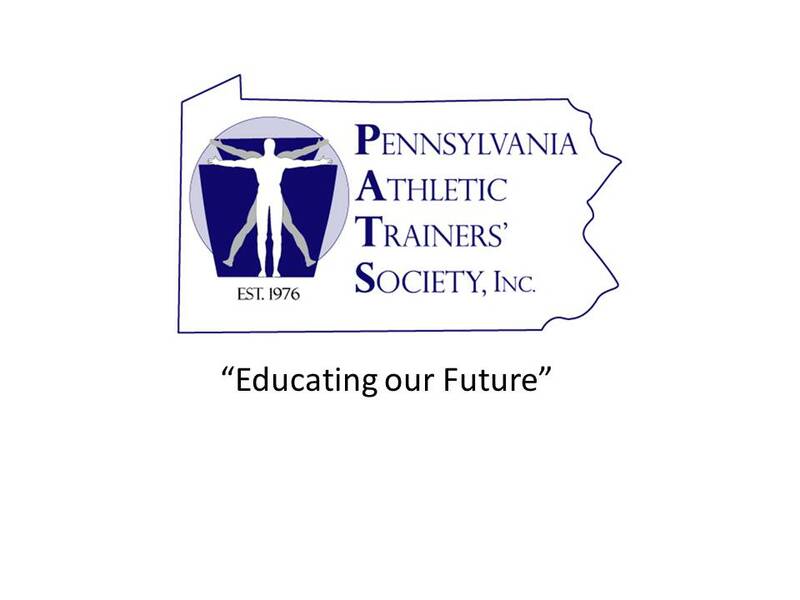 Five members from the Pennsylvania Athletic Trainers Society (PATS) received awards, with two members received the NATA Distinguished Merit Award while three members received NATA Service Awards. Five members from PATS received awards at the NATA Clinical Symposia and AT Expo in Baltimore, MD in June. Two members received the NATA Distinguished Merit Award and three members received the NATA Service Awards. The NATA Distinguished Merit Award (MDAT) recognizes NATA members who have demonstrated exceptional commitment to leadership, volunteer service, advocacy and distinguished professional activities as an athletic trainer. MDAT exclusively recognizes NATA members who have been involved in service and leadership activities at the national and district level. This award was presented to Rick Burkholder and Larry Cooper. Rick Burkholder, a long-time native of Pennsylvania, was born in Carlisle, PA. He attended the University of Pittsburgh, receiving his bachelor’s degree in athletic training. Burkholder then left the state of Pennsylvania for a short hiatus to attend graduate school at the University of Arizona, but then returned to the University of Pittsburgh to join the athletic training staff. Burkholder was a member of PATS from 1987 through 2013, serving as Western Representative on the Board of Directors, on the Convention Committee and as Co-Director of Education. Rick has also held memberships to many organizations throughout the country and currently holds the position of the Head Athletic Trainer with the Kansas City Chiefs and serves as the President of the Professional Football Athletic Trainers’ Society. Burkholder is a 2016 inductee into the PATS Hall of Fame. Larry Cooper is a product of Western Pennsylvania. Cooper started his academic career at Theil College, but transferred to the University of Pittsburgh when he realized he wanted to major in athletic training. He graduated with a Bachelor of Science in Health, Physical Education and Recreation Education Degree with a specialization in Athletic Training. Cooper spent his initial teaching years in Virginia teaching health classes, physical education and adapted physical education while working as an athletic trainer. He then returned to Pennsylvania and has been at Penn-Trafford High School for the last 25 years. Cooper has been active in PATS at the Executive Board level serving as both the Southwestern Representative and Parlimentarian. At the Committee level, Cooper has either served as a member or a Chair of PATS’ Membership, Long Range Planning and Secondary School Committees. At the National level, Cooper has served both as the District 2 Representative, the Chair of Secondary School Athletic Trainers Committee, an Advisory Member to the NATA Appropriate Medical Care for Secondary School-Age Athletes Task Force, serves on the National Federation of High School State Associations Sports Medicine Advisory Committee. Cooper has also been a contributing writer of the NATA Position Statement of Fluid Replacement for the Physically Active, the NATA Inter-association Task Force for Preventing Sudden Death in High School Sports paper and the NATA Inter-association Consensus Statement of Best Practices of Sports Medicine Management for Secondary Schools and Colleges. This most recent award from the NATA is not Cooper’s first award. He was the recipient of the 2003 Micro-Bio Medics Award, The Pride Award for Excellence in Teaching in 1997, the 2008 Teaming with PRIDE Award for Sports Medicine Department Excellence, the 2005 PATS Service Award, the 2011 PATS Distinguished Merit Award and a 2014 Inductee to the PATS Hall of Fame. In 2013 Penn-Trafford High School was the recipient of the NATA Safe Sports Award, the first recipient school in Pennsylvania. NATA Athletic Trainer Service Award (ATSA) recognizes NATA members for their contributions to the athletic training profession as a volunteer at the local and state levels. ATSA recipients have been involved in professional associations, community organizations, grassroots public relations efforts and service as a volunteer athletic trainer. This award was presented to Scott Devore, Jeff Shields, and Jackie Williams. Scott Devore is a native of Eighty Four, PA. He received his Bachelors of Science in Sports Medicine with an emphasis in Athletic Training from Mercyhurst College in Erie, PA. Devore then pursued his Masters of Arts in Health, Physical Education and Recreation with an emphasis in Athletic Training at Western Michigan University in Kalamazoo, MI. He began his professional career at Juniata College in Huntingdon, PA as the Head Athletic Trainer and Head Men’s and Women’s Track and Field Coach. Devore has also served as an athletic trainer in a physician setting and co-founder/co-owner of The Athletic Training Room, LLC. He has extensive experience covering the PIAA State Championships in various sports, District VI wrestling championships, Woodward Extreme Sports and Gymnastics Camp, Keystone State Games, Special Olympics and State College Youth Ice Hockey. Devore has been a member of NATA since 1990 and a member of PATS since 1992. He has served many roles at the state level including PATS Convention Committee, PATS Ad-Hoc Clinical/Industrial Chair, PATS Committee on Revenue Co-Chair, PATS North Central Representative, PATS Governmental Affairs Committee and PATS Concussion Sub-Committee. In addition to the 2016 NATA Service Award, Devore also has been awarded the Henry Schein Award at the 2015 EATA Convention, the National Football Foundation/Central PA Chapter/Athletic Trainer of the Year and Lifetime Achievement Award in 2014, the Drayer Physical Therapy Institute Spirit Award in 2011, the District VI Wrestling Man of the Year in 2010, the Bald Eagle Area Humanitarian Award in 2009, and the District VI Award for Humanitarian/Life Saving in 2009. Devore is a current resident of Bellefonte, PA with his wife Karen. He has a son; Scott, two daughters; Chesli and Kaitlyn, and a stepson; Mitchell. He serves as a licensed athletic trainer at Drayer Physical Therapy Institute and Bald Eagle High School. Jeff Shields, MEd, LAT, ATC has been an NATA certified athletic trainer for 32 years, having the honor of hiring and mentoring over 175 athletic trainers. Shields was one of the first ever athletic trainers hired in a clinical setting in 1984, serving at Camp Hill High School for 20 years. As an NATA Board of Certification approved provider for over 30 years, Shields has directed over 200 continuing education events and the first to offer evidence based continuing education units in Pennsylvania. He has been a member of the Pennsylvania Athletic Trainers’ Society and NATA since 1982, serving on and chairing various PATS committees including public relations, corporate relations and governmental affairs. Shields gives credit to his many mentors through the years; Dave Perrin, Fran Feld and Kip Smith at the University of Pittsburgh and Ted Quedenfeld and Jimmy Rogers at Temple University. In addition to receiving the NATA Service Award, Shields was a 2016 recipient of the PATS Distinguished Service Award. Shields is married to his wife Lori and they have 3 sons; Dan an Eastern University graduate and 4-year letter winner in soccer, Mike an University of Pittsburgh graduate and his son Kyle a senior and a 3 year letter winner in soccer at Hood College. Shields credits everyone – all of his staff and professionals he has been blessed to know and try to work their high standards each day—for his awards. He is truly humbled and bless to be in the rewarding profession of athletic training and to be a part of the athletic training family. Jackie Williams, PhD, LAT, ATC received her Bachelor of Science degree in athletic training from Minnesota State University, Mankato. Williams’ Master of Science degree in Health, Physical Education and Recreation with an emphasis in Exercise Science is from Central Washington University, where she also served as a graduate assistant athletic trainer for 2 years. Williams served as an athletic trainer at the University of Idaho where she developed the university’s athletic training major and guided the program through its first accreditation. Williams is an active volunteer at all levels of the athletic training profession. She has served as club advisor for athletic training students, presented at high school career days for potential athletic training students, guest presented at several high school sports medicine classes, and coordinated high school students observing in the athletic training facility. At the state level, Williams has served as PATS Education Committee Chairperson, Idaho Athletic Trainers’ Association summer meeting liaison, Scholarship Committee Chairperson, and participated in the state of Idaho’s Division of Professional-Technical Education Health Professions, Sports Medicine Curriculum Team. Nationally, Williams served on the NATA Ethics Education Project Team, as an NATA Ethics Judicial Panel member, and was a member of the NATA Committee on Professional Ethics. For several years, she was a Test Site Administrator and continues to review proposals for the NATA convention program, is an NATA Athletic Training Education Journal Advisory Board committee member, and reviews manuscripts for the Internal Journal of Athletic Therapy and Training. Currently, is an Associate Professor in the Department of Exercise and Rehabilitation Sciences at Slippery Rock University. She joined the SRU faculty in 2007. She currently teaches and advises athletic training students and serves as the Slippery Rock University Athletic Training Program Director and Exercises and Rehabilitation Sciences assistant chairperson. For more information regarding this topic of to schedule an interview with PATS President Gaetano Sanchioli, MS, LAT, ATC, PES, (president(at)gopats(dot)org) please contact Linda Mazzoli, MS, LAT, ATC, PATS Executive director at patsexecutivedirector(at)gopats(dot)org.